Cheap Markets of Kolkata and What All to Buy There ? You are here: Home / Travel Blogs / India / East India / Cheap Markets in Kolkata & What All to Buy there ? 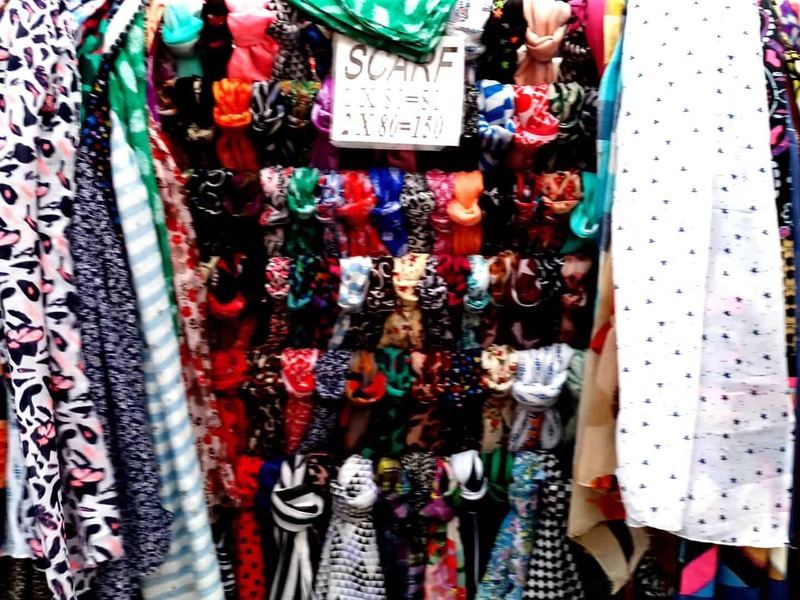 Cheap markets of Kolkata abound in fancy goods, apparels, local crafts, lip smacking food and so much more. Enriched with colonial architecture, cultural heritage and places of historical importance, these markets in Kolkata welcome you with warmth that you might not find elsewhere. If you love shopping and are roped in on a tight budget, Kolkata won’t let you go empty handed. The cheap markets of Kolkata have so much to offer for its local residents as well as travelers alike. Not only will you be able to find an assortment of things but also at reasonable prices. Kolkata , the city of joy was once the capital of India under the British rule. This huge metropolitan city is famous for its lively inhabitants, delicious food and buzzing streets. Strangers become friends in no time here. Participate in the open cultural and religious events like Durga puja and you will feel you’re at home. From cream coloured saris marked by red border to thick bindis, from rustic tapestry to old books – the bazaars of Kolkata have it all. 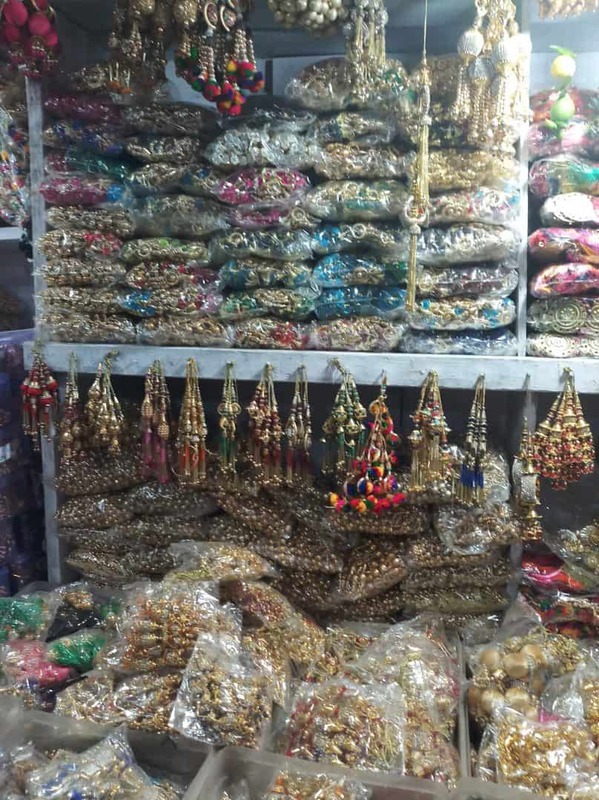 In the current blog, I will elaborate on the many cheap markets of Kolkata, the stuff available there and also my recommended picks. 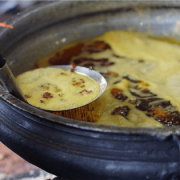 What all delicacies to try on the streets of Kolkata ? Kolkata as a city is buzzing with all kinds of markets. Let me introduce you some of the places that I prefer. The three most nominal markets or bazaars (as we call them in Hindi) in Kolkata for both the locals as well as the tourists are as follows. Since Kolkata is a metropolitan city, it has no dearth of market places. The city, in addition to various street markets also comprises of a number of luxury malls. If you happen to visit the latter during the annual discount season (december-january and july to august), you can avail some great offers from these otherwise expensive places. Here are some of the malls and street shopping markets in Kolkata that are recommended by me. Check them out for yourselves and find your favourite pick-ins. Now that you know about all the must visit cheap markets in Kolkata as well as luxury malls, it’s time for me to mention the things that you can buy there. 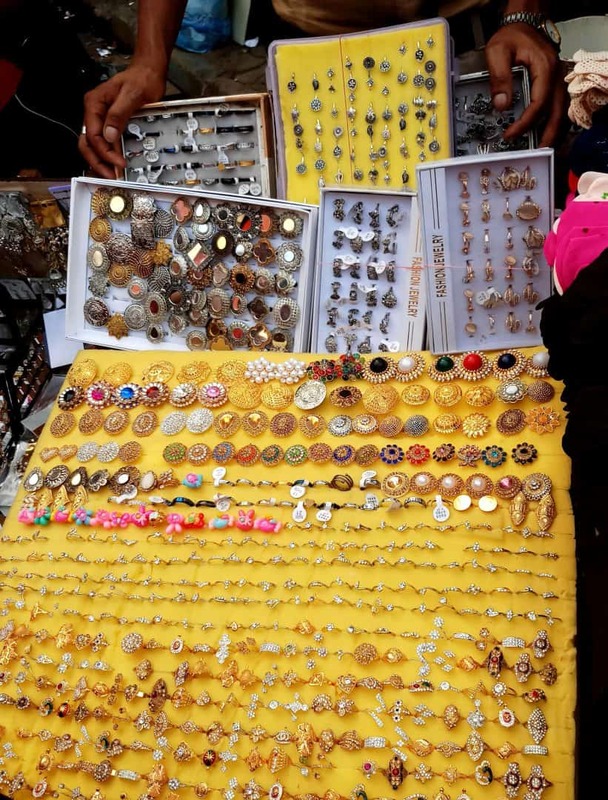 What All to Buy from the Cheap Markets of Kolkata ? 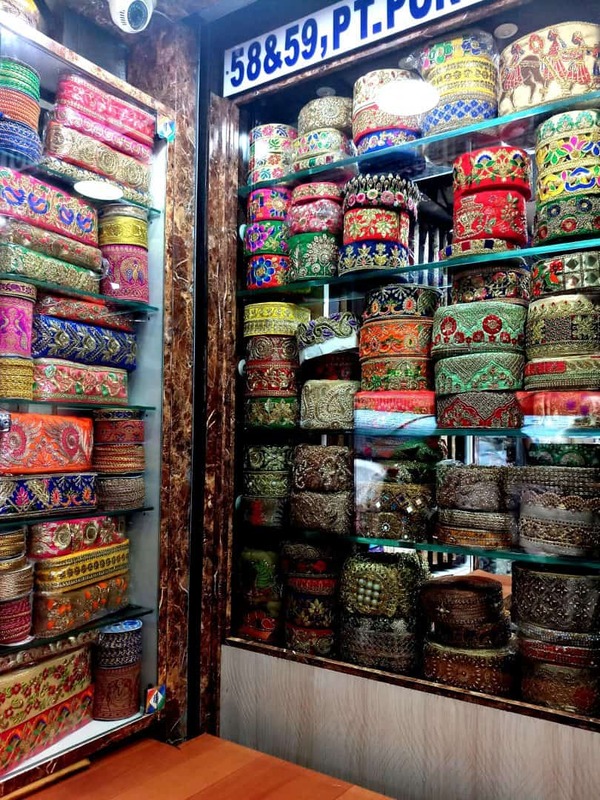 If you are a first time traveler to the city of joy, it is important that you know about the things that you should be buying in Kolkata or just taking back home as souvenirs for friends and family. The three cheap markets of Kolkata, also the most popular ones need special elaboration. So I’m putting forth some details for you below. This is the first market on my list and suggest that you visit here for sure, when you’re in Kolkata. The colonial structure of New Market will give you a feel that time has stopped here. The market had first started its journey in 1857. Over the years, Calcutta became Kolkata and everything in the city changed but the structures of New market stands with pride as living history. Innumerable small shops and large number of customers keep the area buzzing at all times of the year. The sellers arrange their variety of items on the street and customers can go and ask the prices, if not written already. The sellers answer all your questions with full energy. It is you who needs to gear up fully charged before you visit New Market. It is not going to be a short shopping trip because your heart will not allow you to come back without exploring the whole place. Things to buy from New Market ? Here are a few important items that you can easily shop from New Market. 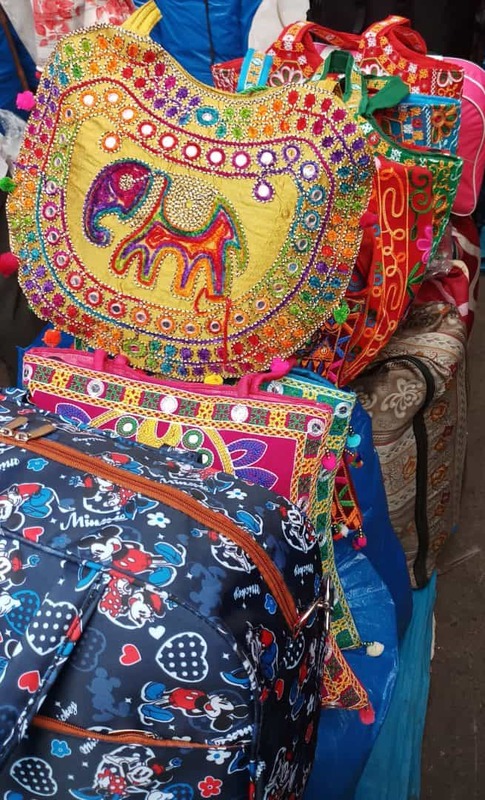 You will see thousands of colorful bags of various shapes, designs and sizes. Hand bags, clutches , side bags, jholas , purses and more. 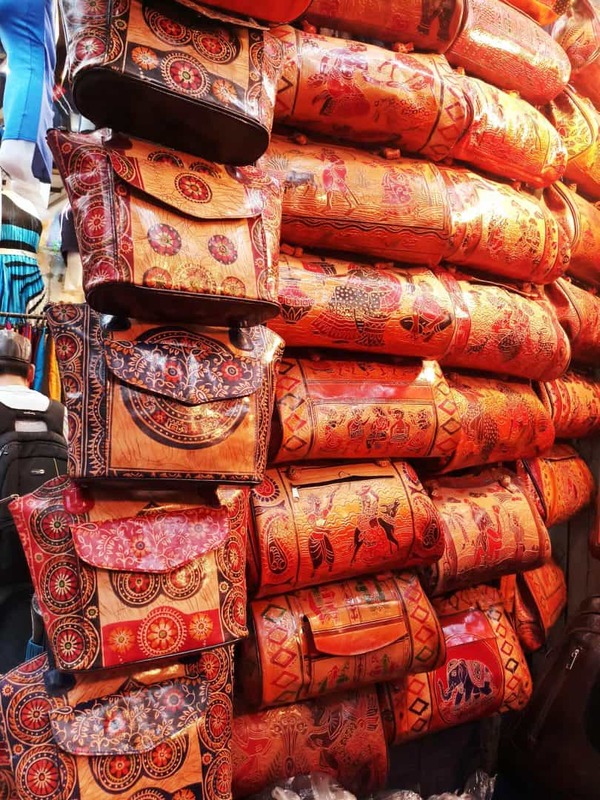 Material can be leather , cloth bags with stitched designs using coloured nylon threads and wool or bags with hard texture much alike wooden texture and golden brown in colour with printed figures on them. Classy ones I must say ! Have you ever bought figure rings or toe rings with 10 INR ? Well you can select from hundreds of rings for 10, 20 and 30 INR at New Market. Price of Statement rings may start from 80 INR. Bangles or Churis in Bengali is a famous accessory. Glass bangles with stones on them can steal the show in any wedding ceremony. Price starts from Rs 60-70 INR. Best place to buy bangles is from the street shops in front of ‘Treasure Island’, a mall in new market area. Hundreds of cute fluffy teddy bears lie on the roads of new market all piled up together one above the other. Price starts from 100 INR. 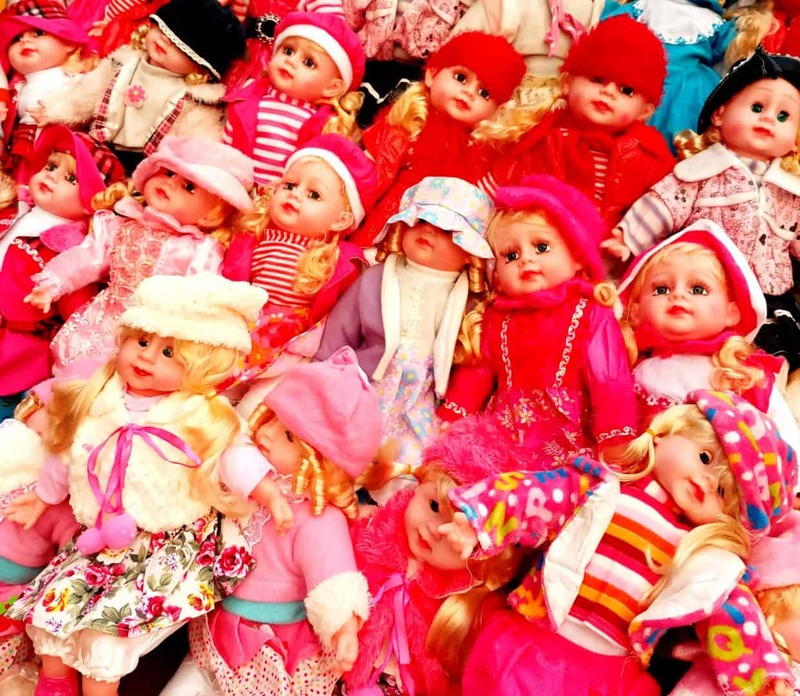 Dolls and a big section (above the Sampark Mall which is on basement) consists of games , play stations, toy cars etc. You won’t get watches anywhere cheaper than this place. Fancy watches with bright stones make them glitter. One condition : No warranty. However they start from as low as 60 INR and you will get to choose from a wide range of products. Dresses, Kurtis, Punjabi chunris etc are available in various designs, colours and materials. These include grocery ranging from fruits , vegetables and what not. Moving on from New Market to Bara Bazaar now. Bara Bazaar witnesses hundreds of footfalls daily. You too should be a part of the shopping experience here. Bara in Hindi means big. As the name suggests, it is a huge market with thousands of stalls. Bara Bazaar is a hub for various kinds of products to be sold as wholesale for buyers from all over India, Bangladesh and some parts of other countries as well since 18th century. Cloth merchants of West Bengal specially buy clothes, dress material from Bara Bazaar. This market covers the entire area from Posta to Canning Street, Strand Road to Chitpur Road. Here are the stand out items that you can shop from Bara Bazaar. 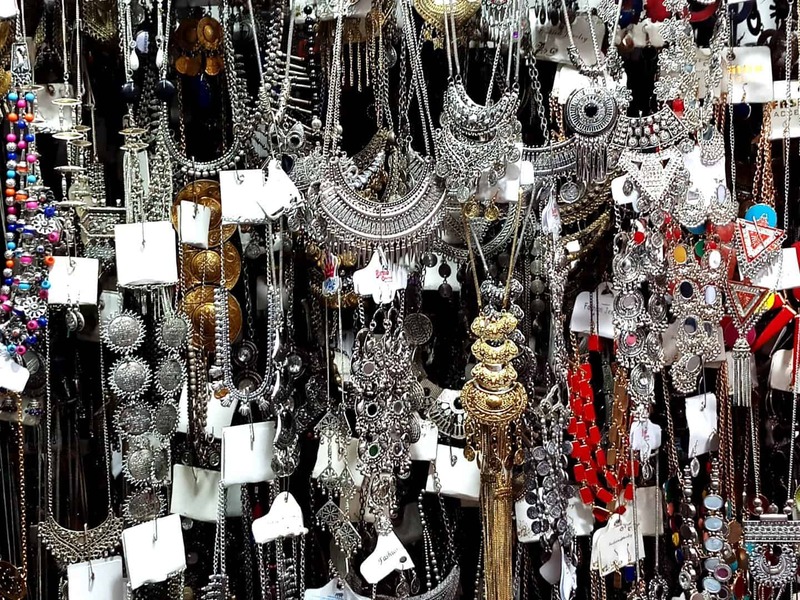 You should see the huge collection of junk jewelry that Bara Bazaar offers. Starting from as low as 20 INR. You have to bargain to get the best price. 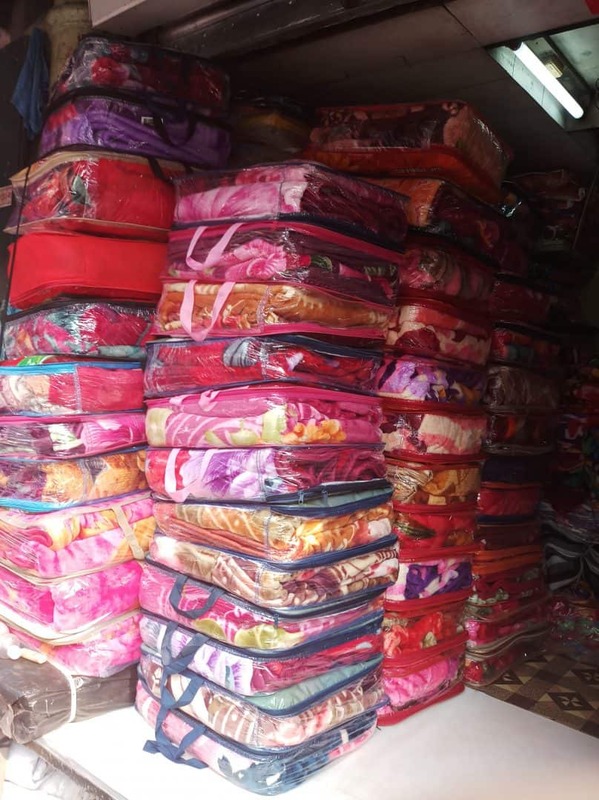 If it is winter season during your visit, you will see rows of stalls displacing blankets starting at unbelievable prices. A small blanket costs around 70 INR. Shawls and sweaters too are available at takeaway rates. Apart from kurtis , saris on street shops, do visit Priyo Gopal Bishoyi – a shop in this bazaar with latest and tradition saris at fixed rates. Do you have a plain sari, kurti or any dress that you wish you could add some colour or design to it ? Can that design be of your choice ? Well yes ! Here you can get various ready made designs to complement your dress the way you like. Even if you don’t have a plain dress, you can always keep these for future use. Your shopping mood will get charged up when you come across these. Take some ‘gurer misti’ (molasses sweets ) home . 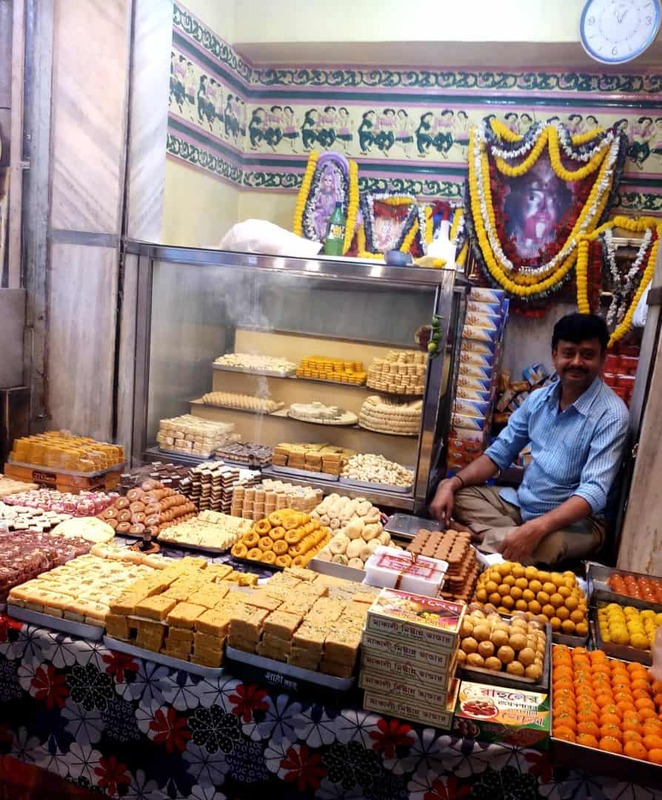 You will get delicious sweets – sanpapri, sandesh, mowa, laddu of various kinds here. See the picture to get a taste. Home decors, food, clothes , tea, spices – you will get anything and everything here. Name something and it will be found. Quality of lassi is mind blowing in Bara Bazaar. When you really drop after you shop, have a glass of cool ‘lassi’. Perfect ! Moving from Bara Bazaar to Gariahat. Visit here for that personalized street shopping experience. Covering a huge area and a never ending lines of shops display a variety of items. Best part is the price. Unless ‘fixed price’ tag is given , you can demand to get something at half the price , especially on clothes. Say 200 INR if seller says 500 INR ; you may get it at 250 INR if luck permits! Visit to the ‘Select stores’ shop to get authentic saris at fixed price. The saris displayed will force you to enter the shop. The things that can be bought from Gariahat are as follows. In addition to all the above mentioned cheap markets in Kolkata, there is also this place known as Hatibagan market. This is an old market place of Kolkata where you can easily shop affordable things. The stuff available for women is especially nice. So if you have the time, do visit this place. Best handloom sarees are available in Dakshinapan market. Price of the really good ones starts from 1000 INR. You can pick some handicraft items too from here. Other good sari shops include Priyo Gopal bishoyi and Mohini Mohan Kanjilal (in college street). Kolkata is famous for sweets. 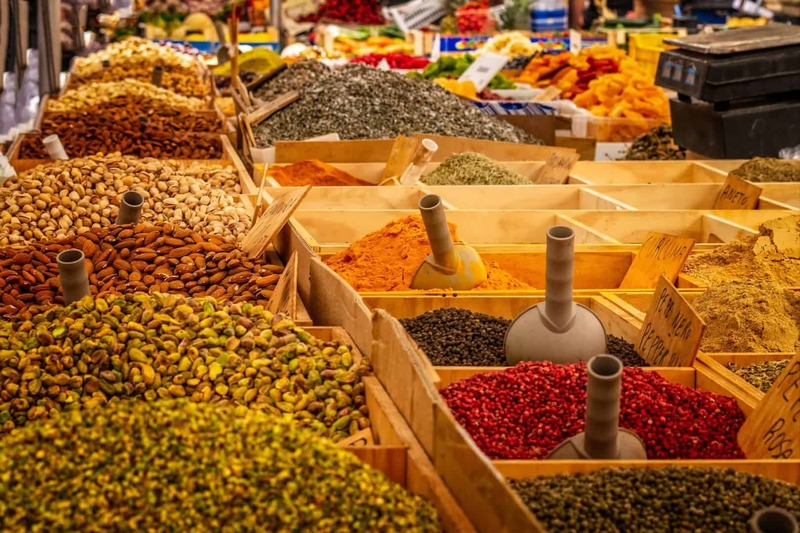 You can get all kinds of Indian spices in Bara bazaar and New market. As for sweets, do try them even if you are on a diet. The sweets will taste so good that you won’t mind putting on some holiday weight. A trip to the cheap markets of Kolkata cannot be deemed complete until you taste the local Roshogolla, Shondesh and other delectable sweets. Also, some of the famous snacks. Bedouin Sher E Bengal Restaurant (opposite to Basanti Devi College), Street side shops. Plenty of sweet and dry food shops. Bara Bazaar will have them all. Moving from the culinary places to literary circles of Kolkata now. 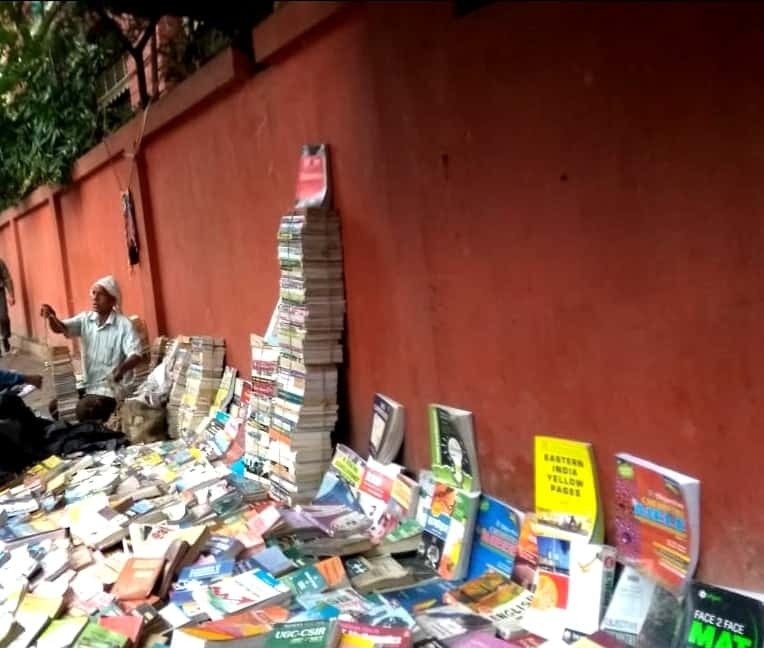 College Street (boi para) or Book Town is world’s largest market for second hand books. 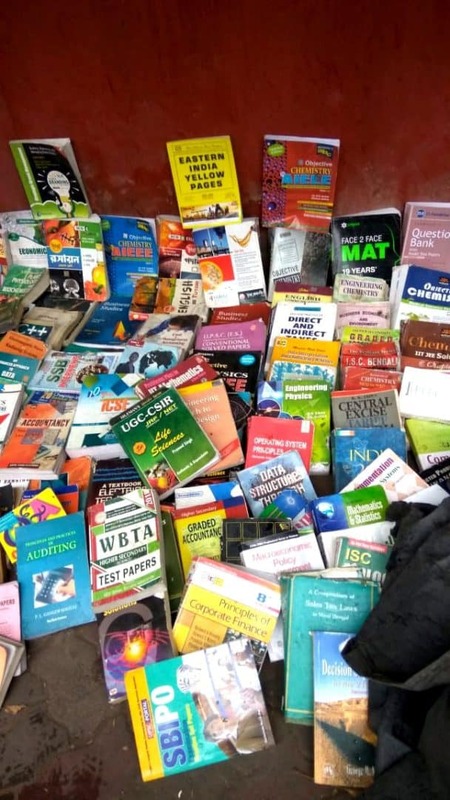 It is a place where you get every kind of book possible. Academic to story books, new to antique, Boi Para is surely the place for bibliophiles. A row of hundreds of book shops are there allowing you to choose from lakhs of titles. Best part is that the prices are negotiable. The collection of old books is quite decent here. You get old and rare books at unbelievably discounted rates. You can get story books from price as low as 30 INR. Pick as many as you want. After all you are in Kolkata, the land of Gurudev – Rabindranath Tagore (He was the first Indian to win a Noble Prize for Literature). College street book shops remain closed on Sunday and on Saturday they remain open till 12-1pm. When you visit College Street, do not forget to visit the historical Coffee House located at the heart of college street , near college square. I highly insist you visit here. Indian legends like Satyajit Ray, Amartya Sen and many famous poets, authors, politicians, artists have all once chatted here over a cup of coffee. Established in 1942 by the British rulers , this place is a heritage eatery. A cup of coffee, a cutlet and the flavour of coffee house will make you be at awe of the place. Coffee house is open everyday from 9am to 9pm except Sunday (9am to 12:30pm , 5pm to 9pm). If you really want to explore the cheap markets of Kolkata and enjoy your shopping experience, learn the art of bargaining. You cannot begin to imagine the reduced prices of things in Kolkata’s markets once you bargain. So make sure to bargain and walk away a happy shopaholic. 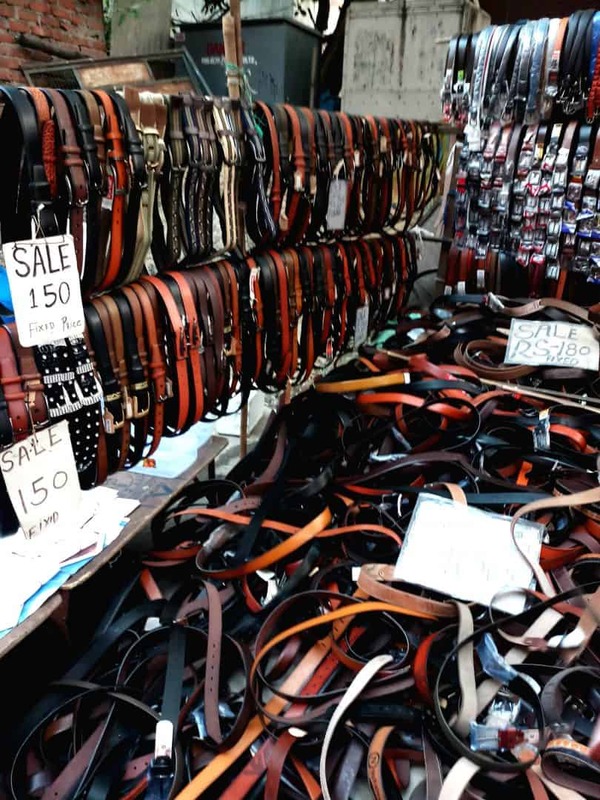 Every newbie visitor heading to the cheap markets of Kolkata should be aware of certain things that most locals would surely know. Being from Kolkata myself, I’d like to offer the following tips to all shopaholics. The cheap markets of Kolkata will remain super crowded at all times. So be patient and wait till your turn comes. You have to bargain. There is just no escaping this fact. So learn to bargain. Taste as many street foods you want to without worrying about the hygiene. Just because they are being sold on the roads don’t make them dirty. So you will not fall ill.
At least once, try the Bengali ‘phuchka.’ Its worth it. Bengali ‘rosogolla’ and ‘misti doi’ will complete your Kolkata tour. So do not miss out on them. Make sure to keep the above tips in mind at all times while shopping in the cheap markets of Kolkata. Here are some essential tidbits about Kolkata as a travel destination. This information will help you plan your trip well. Kolkata is a lovely destination when it comes to shopping, eating and celebrating indigenous festivals. It’s the land where Shakti (the powerful goddess in Hindu mythology) is revered and the people have their faith in goodness over evil. If you haven’t been to Kolkata till now, I insist you do so now. Plan your trip and feel the vibe of the garden city yourself. Be patient, bargain boldly, eat tasty food and relish the experience. 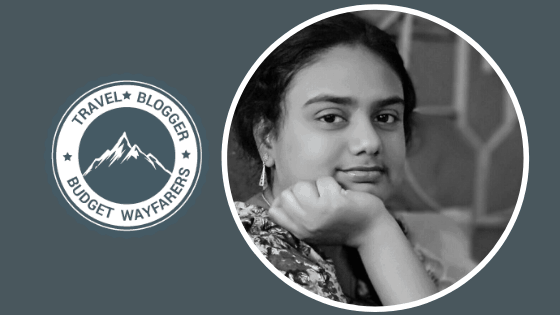 Shiny Hoque is a prolific writer by passion and the community manager for Sheroes by profession. She believes that written words have the power to change the world. Shiny dreams to travel the world, meet new people and write their stories. THIS POST ENTITLED, “CHEAP MARKETS IN KOLKATA AND WHAT ALL TO BUY THERE?” IS AN EXCLUSIVE PROPERTY OF BUDGET WAYFARERS. ANY INDIVIDUAL OR ASSOCIATION INDULGING IN PLAGIARISM WILL BE DEALT WITH STRICTLY. IF YOU WANT TO USE INFORMATION FROM THE ARTICLE ABOVE, KINDLY QUOTE THE SOURCE. 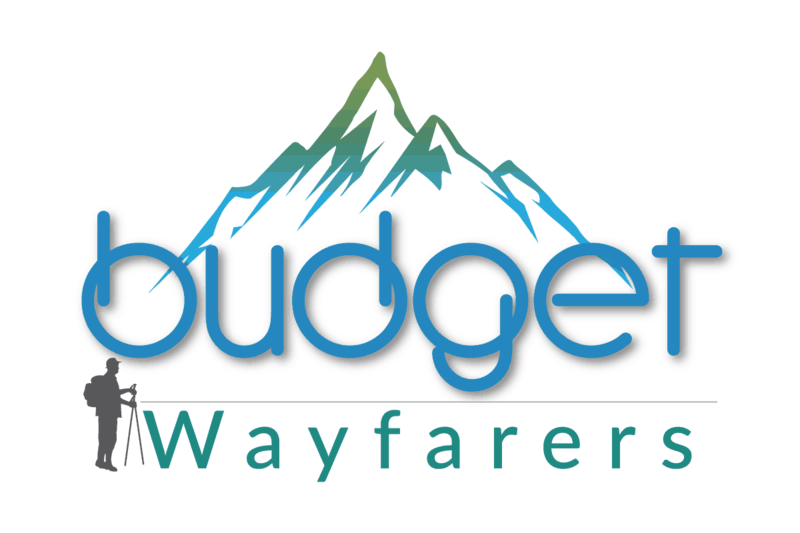 https://www.budgetwayfarers.com/wp-content/uploads/2019/02/Cheap-markets-of-Kolkata.png 315 560 Budget Wayfarers https://www.budgetwayfarers.com/wp-content/uploads/2018/04/1200X800.png Budget Wayfarers2019-02-04 15:59:442019-03-02 10:59:33Cheap Markets in Kolkata & What All to Buy there ?